Todd Snyder's man is upfront about his pocket issues. Photo by Yours Truly. IN elevating the biker jacket, Todd Snyder got carried away, also working his particular brand of craft on cableknit sweaters, shirts of many stripes and, trousers. All of this in paying homage to a time "when gentlemen were outlaws, and vice versa." Perhaps only such a man would have the effrontery to wear his cargo pant pockets out front. Kinda cool, no? 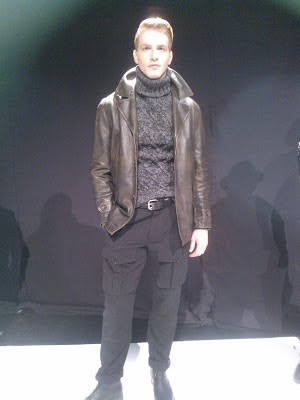 The black wool pant is the most interesting thing Yours Truly has clapped eyes on thus far of the Fall 2013 collections on Day 1 of Mercedes-Benz Fashion Week New York. Visit http://www.mbfashionweek.com to learn more about Mercedes-Benz Fashion Week New York.